Will be Sold, Before the door of the Eagle Tavern. At 12 o'clock, on Monday the 24th instant, A Number of Valuable Slaves. “Will be Sold, Before the door of the Eagle Tavern. 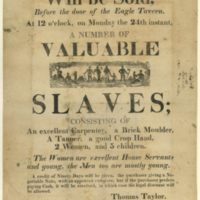 At 12 o'clock, on Monday the 24th instant, A Number of Valuable Slaves.,” To Be Sold: Virginia and the American Slave Trade, accessed April 19, 2019, http://www.virginiamemory.com/online-exhibitions/items/show/378.